Desperate to keep Eurovision hosting in the face of growing boycott calls, the Israeli government has dropped the condition that the event must take place in Jerusalem. This marks a striking failure in Israel’s PR efforts to assert its illegal claim over the city. The BDS movement sees this as the first milestone in the campaign to boycott Eurovision 2019 if it is hosted by Israel while it continues its decades-old, grave violations of Palestinian human rights. The UN and the EU consider East Jerusalem as part of the occupied Palestinian territory and do not recognize Israeli sovereignty over any part of Jerusalem. 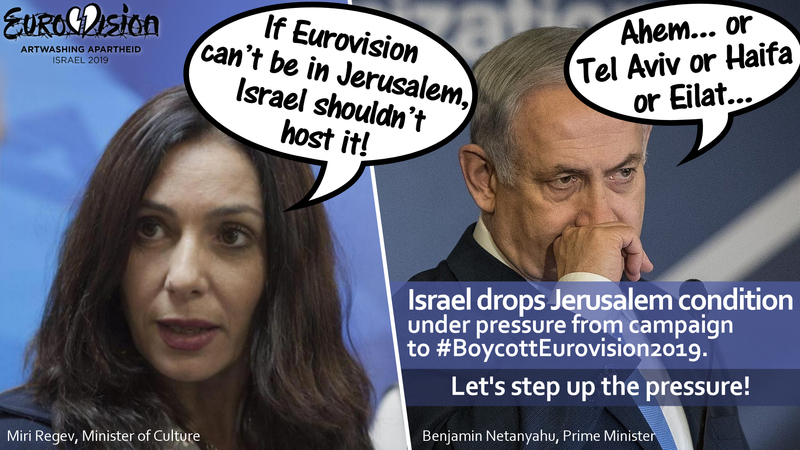 On June 7, Israeli culture minister Miri Regev insisted that “if [Eurovision] can’t be in Jerusalem – we shouldn’t host it.” Three days later, the Israeli government sidelined her and dropped the demand for holding Eurovision in Jerusalem, moving instead to an open tender process. Now Israel is hinting that Tel Aviv may be its best bet. The #BoycottEurovision2019 campaign continues to gather pace across Europe, with endorsement of major public figures and artists in Ireland, Iceland and beyond. We call on the EBU members to listen to the demands of this growing boycott movement and move the contest from Israel.